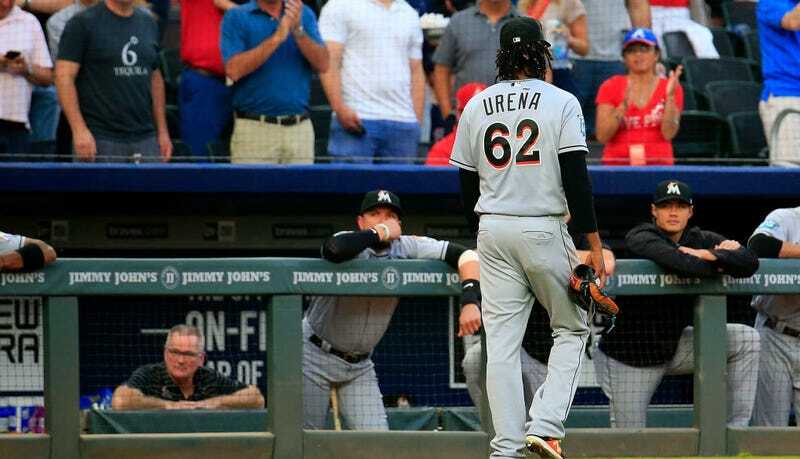 Marlins pitcher Jose Ureña was suspended six games by Major League Baseball for his bush-league plunking of Ronald Acuña Jr., to break up Acuña’s three-game streak of leadoff dingers. As should be expected whenever a player is suspended, Ureña has appealed the punishment, which means he is eligible to pitch for the Marlins while the appeal process plays out. This means that Ureña will take the mound against the Washington Nationals on Sunday. It also means that Ureña could be due up in the rotation when the Marlins host the Atlanta Braves for a four-game series starting August 23. To hell with unwritten rules—if nothing else, if Ureña isn’t serving a suspension on those dates, and his spot in the rotation comes around, he should have to stand in there and sweat bullets while a Braves hurler pegs 95-mph baseballs in his general direction. Ah yes, wouldn’t want to subject an important player to a deliberate heater to the elbow or anything.